Scales glinting, this Komodo dragon looks, well… stoned. We’re cruising Indonesia on the Alila Purnama. And today we’re taking a break from diving Komodo National Park – we’re ashore on a Komodo island tour looking for the island’s fearsome dragons. And we’ve found one. 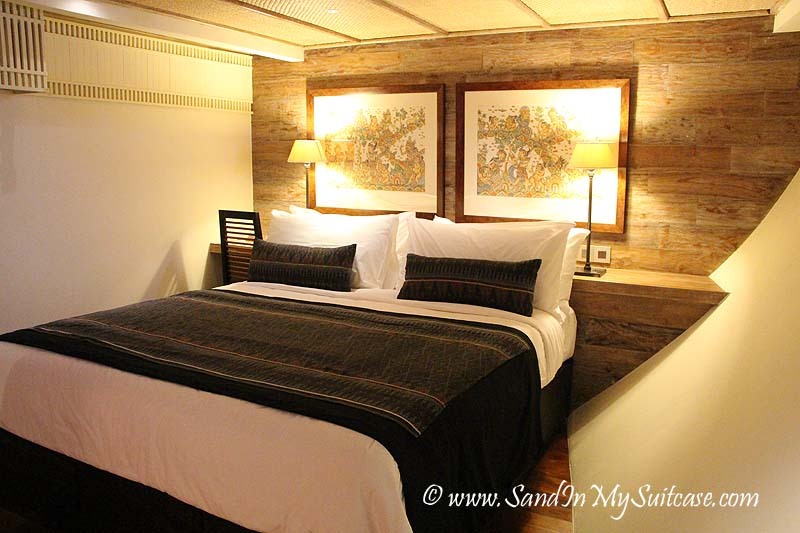 The stylish Alila Purnama – Staterooms, goodies, daybeds on deck, service, etc. Diving Komodo – Dive sites, sea life, etc. 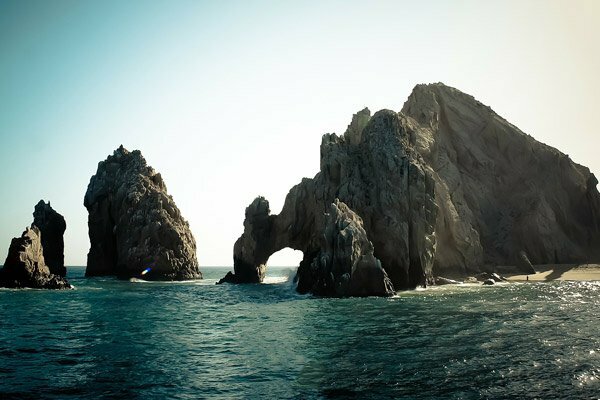 Non-dive activities – Kayaking, hiking, chilling on deserted beaches, etc. 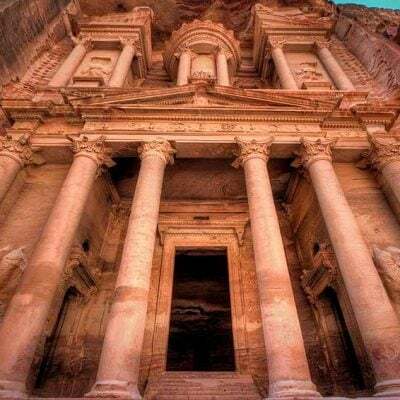 Booking details – Alila Purnama itineraries, etc. Never mind that the Komodo dragon is the world’s largest and most lethal lizard – in 2009, two dragons attacked and killed a fisherman picking wild apples when he fell from a tree. Or that the deadly creatures (which lunch on goats, deer, wild boar and yes, occasionally humans) have inch-long serrated teeth that drip hemorrhagic venom. This dragon looks harmless, dozing in the sun. Like a college student on a Sunday, lazing about with earbuds plugged in. This is the dangerous beast we’d so wanted to see? This Komodo dragon may look harmless – but watch out when it moves! But whoah, when it starts to move, spitting out its menacing tongue and throwing its body from side to side, with its powerful muscular tail snaking behind, it’s another story. “Dragons run fast, up to 12 mph,” warns Tasrif, our ranger-guide as he hustles us out of its way. Curiously, Tasrif has no gun, just a large forked stick which he holds at the ready. But no one fancies being the animal’s next meal. So we cautiously walk around this specimen and continue our hunt for more sightings – the infamous dragons are found only on Komodo and neighboring Indonesian islands. Sailing Indonesia on the Alila Purnama to Komodo National Park offers a host of surprises and thrills, of which the dragons are just one. 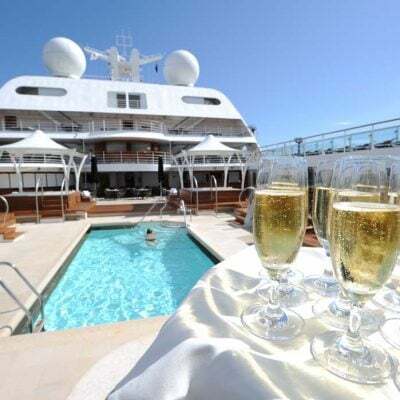 Indeed, one of the biggest surprises is how luxurious a bespoke sailing ship experience can be. Other sailing-style ships like the Star Clipper offer Indonesia cruise itineraries that include Komodo Island. But the Alila Purnama (translated, the “Full Moon”) is much smaller. Launched in 2012, she was hand-built in the style of a traditional phinisi. These two-masted ships were originally used by the Bugis seafarers plying Indonesian waters in days gone by, trading in bird-of-paradise feathers and other exotic goods. All polished teak and rattan, with billowing camel-colored sails, the Alila Purnama is a 150-foot beauty. Though nautical in feel, her five staterooms could be mistaken for stylish hotel rooms (Singapore-based Alila Hotels and Resorts manages the ship) – with queen-size beds, 400-thread count linens, mother-of-pearl mosaic tiled showers and individually-controlled air-conditioning. And oh the goodies we discover! Pillow-soft bathrobes and slippers, a wicker beach bag, sunhats and sarongs, a yoga mat and a huge wooden box filled with lemongrass body lotions, after-sun cooling gels and face mist. Up top, on the sweeping bow deck, there are cushioned double daybeds under parasols for each couple to lounge on (iced cappuccinos anyone?). There’s lots of space for privacy too, even a small library with books on the colorful local sea life. 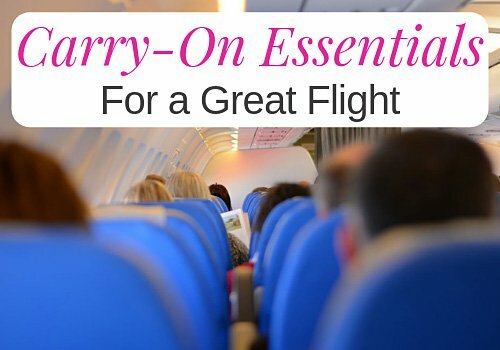 Most important, the service onboard is first-class. In no time at all, the Indonesian waiters know each guest’s individual preferences for drinks, coffees (double shot? extra foam?) and teas, which magically appear at each meal before anyone can ask. If this is sailing, sign us up! Our voyage starts with a 95-minute prop flight from the island of Bali over a sprinkling of velvety green islands, ringed by different shades of turquoise ocean. Indonesia is a vast archipelago of over 17,000 islands (1,000 inhabited), so we’ll only be sailing Komodo and a few other select islands. In Labuan Bajo on Flores island – a tiny speck of a town with tin roof houses and feisty chickens scurrying across red dirt roads – we transfer to the Alila Purnama, anchored in the bay. Up first? Surrendering our shoes and sandals. Going barefoot is the rule sailing Indonesia on this ultra-luxury Komodo liveaboard. Over lunch around the massive dining table, we meet our six fellow guests – a Singapore-based couple celebrating their 10th wedding anniversary, two French women friends and a honeymoon couple from Mexico City. 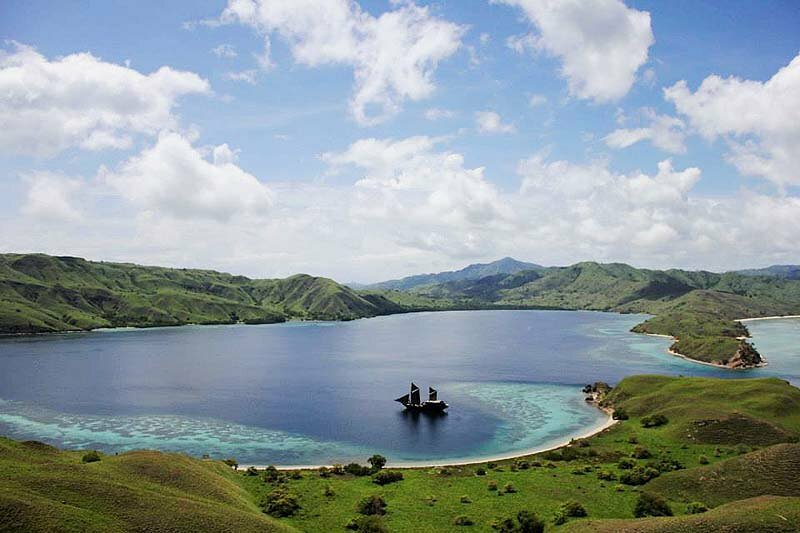 How lucky are we to be sailing Indonesia on this deluxe Komodo liveaboard! Later, the certified scuba divers among us suit up for an easy reef dive, surfacing at sunset beneath an apricot sky. The Alila Purnama has its own fully licensed PADI dive center onboard catering to beginner and expert divers. 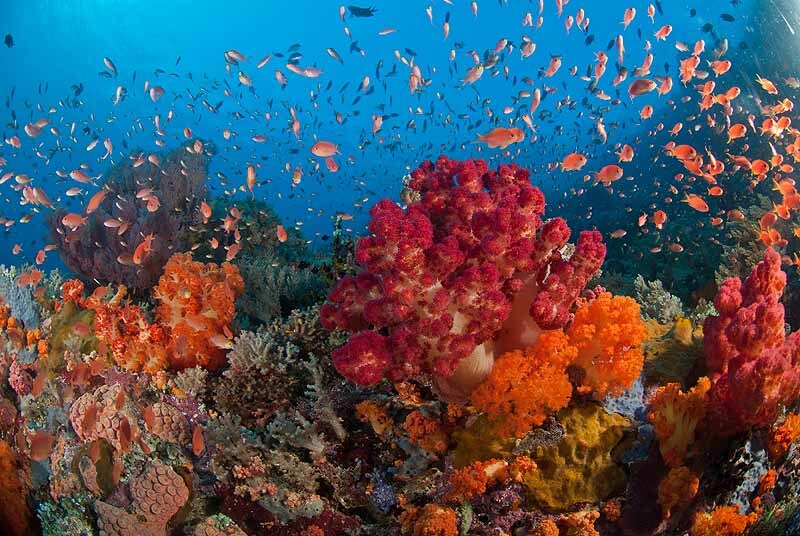 All the diving in Komodo we could possibly want is included. Over the course of our cruise, divemaster Johnny and our cruise director Mario (also a master dive guide) take us out on up to three dives a day, even a night dive. Our eyes pop with the underwater sights we see diving Komodo National Park. We explore garden upon garden of candy-colored corals in wonderful and weird shapes – lilac fingers, monster brain coral and yellow heart valves. Bug-eyed garden eels peek out from their sand holes. Blue-spotted stingrays coast by, and enormous sea cucumbers shaped like Styrofoam boxes rest on the sandy bottom. Yellow-and-black striped Moorish Idols, their graceful dorsal fins fluttering behind them, nibble away. At Castle Rock – a colossal coral-encrusted pinnacle rising to 13 feet underwater, rated one of the world’s 10 best dive sites – Mario expertly guides us during a lull between normally strong currents into a fish superhighway. 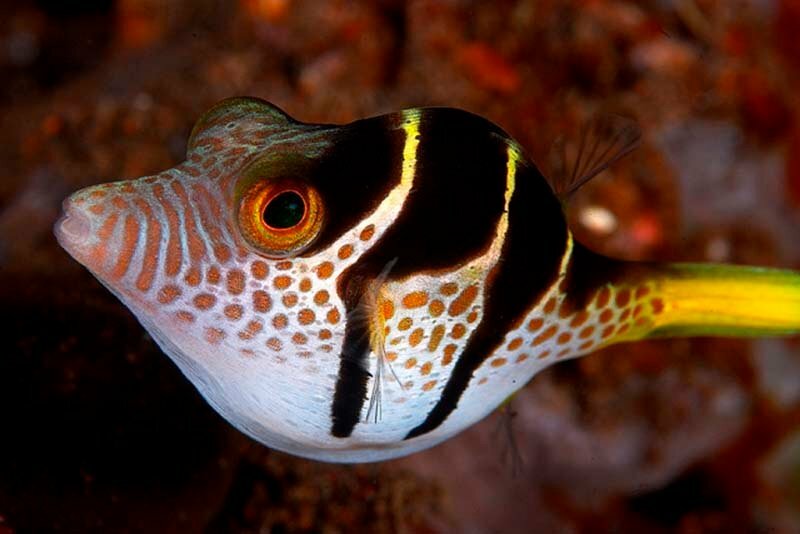 We’re engulfed by more sea life than we’ve ever gaped at in our lives – enormous schools of silvery jackfish, white-tipped reef sharks, slow-cruising turtles, lionfish, fat puffer fish, even a pair of lacy, superbly camouflaged, leaf scorpion fish. Why are we so happy? We’re about to do some more Komodo diving! Each time we clamber back into the zodiac, we’re handed fluffy towels. Minutes later on our luxurious Komodo liveaboard, we’re welcomed back with glacier-cold facecloths and fresh papaya-and-mango or orange-and-carrot juice. One of the 16 staff always starts helping us off with our wetsuits. “Sit, please sit!” we’re cajoled, and the neoprene is peeled off us while we snack on smoked salmon appies. Diving has never been so pampered! Sometimes we join in the non-diving guests’ activities – kayaking (the Alila Purnama carries its own sea kayaks), snorkeling and going for a spin on the “doughnut” inflatable, pulled behind a high-speed boat. On a couple of occasions, discreet hands set up cushions under umbrellas on deserted islands, hauling over coolers of sodas (and face mist too) – so we can lie back and revel in the awesomeness of being the only ones on a strip of talc-white sand, with no other souls in sight. One afternoon, we all scramble up an islet’s rocky cliffs for a sunset view of the islands below and Mount Sangeang (“mountain of spirits” in Balinese) in the distance. The volcanic mountain sits in Indonesia’s notorious Ring of Fire. And then, in the sweltering heat, we arrive at Komodo for our walk through the nature park. After the initial excitement of our first dragon, we spy a couple more resting in the bush. About 50 to 60 intrepid visitors set foot on the island each day to look for the dragons (over 1,800 call the island home). Tasrif tells us one dragon is occasionally fed so it stays close to the ranger hut, guaranteeing expectant visitors at least one sighting. Back at the landing site, the biggest danger we face is parting with our souvenir money. Michael, the shrewd trader from Singapore, shows interest in the “real” black pearl necklaces going for $10 or less, and we’re all mobbed by a crowd of skinny young men hawking carved dragons and other local artefacts. Of course, a two-foot wooden dragon finds its way into our suitcase. “Real” pearl necklaces for sale on Komodo Island – for less than $10! Like small-ship adventure cruising? 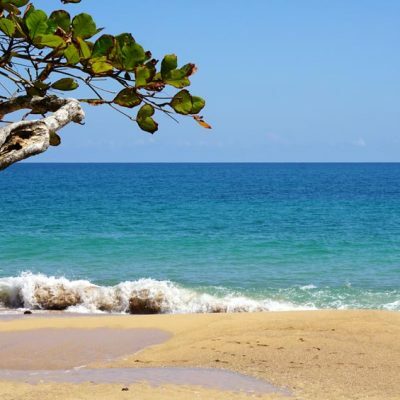 Then you’ll love this UnCruise Costa Rica trip! Our last evening brings a special surprise. Instead of dinner onboard, a motorboat takes everyone to a beach, where the staff have created a restaurant in the sand for us. We’re escorted to our table along a sandy path lined by hand-placed seashells, past a freshly-built Komodo dragon sand sculpture. Lanterns hang on sticks and candles glimmer in holes in driftwood and rocks. Our meal is served, course after course – Greek salad, shrimp and barbecued beef, grilled calamari in a spicy tomatoey sauce, fresh fish, and finally chocolate mousse cake. At the urging of his staff, Mario picks up a guitar and sings. We join in too as best we can – we’ve all become family over this week and can’t believe this sailing adventure must soon come to an end. The deluxe Alila Purnama phinisi ship sails several itineraries: a Komodo Island cruise from July to September; the remote Raja Ampat (in Indonesia’s West Papua province) from November to February/March; Cendrawasih Bay from March to June; and the Banda Spice Islands in October. The Komodo Island trip and most Raja Ampat trips are six nights long; Cendrawasih Bay trips are five nights each. Some nine-night voyages are also offered. 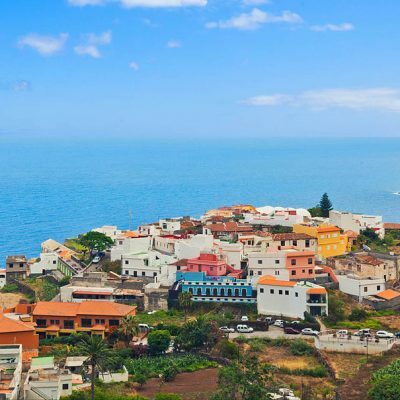 Unlimited scuba diving, activities and meals are included in the rates (but not alcohol). 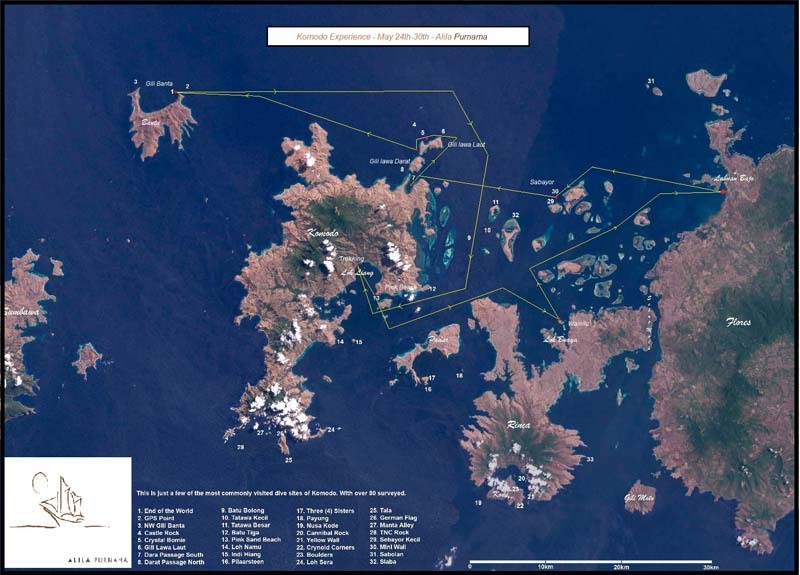 You have to make your own way to Flores island, a 95-minute flight from Bali. We’ve flown EVA Airlines a couple of times now to Asia; they fly to Bali via Taipei and we’ve found their ticket prices and service to be good. See our Eva Air review. See the Alila Purnama website. How lucky were we! 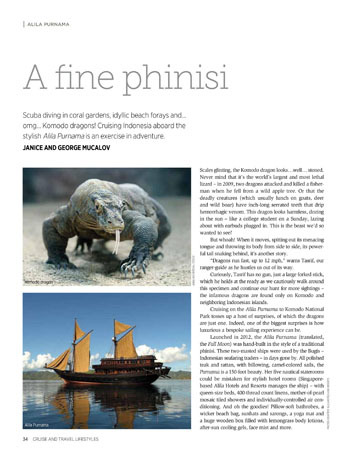 We sailed on the Alila Purnama on assignment for Cruise & Travel Lifestyles magazine. Our story was published in the Fall/Winter 2015 issue. Click on the image below to read a PDF of this article. We learned to dive many, many years ago. It’s not hard, and with the certification lessons you understand what to do and what not to do. (The only thing is if you have ear problems and can’t equalize, then you may not be able to dive.) 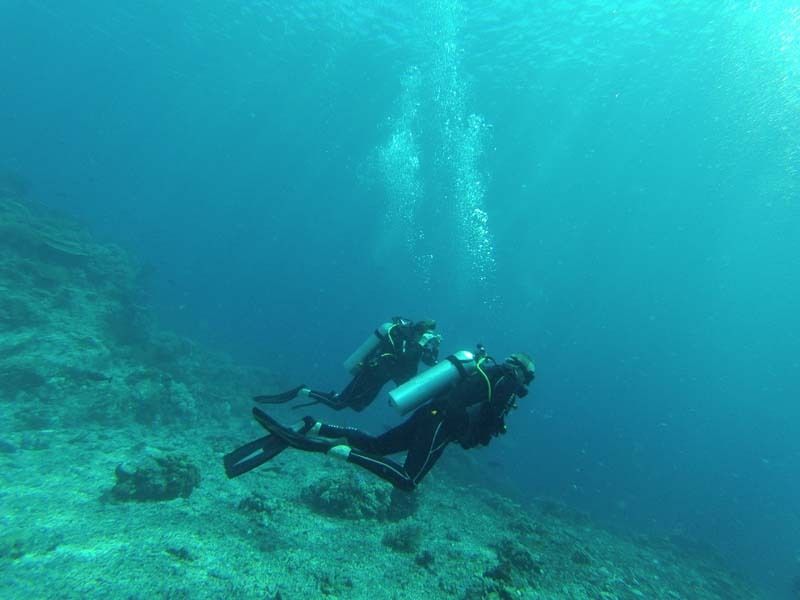 But we’re dive wusses – we only like diving in warm water where the visibility is super clear. This trip is incredible! We had looked into doing one of the cheaper trips to Komodo Island when we were in Bali last year, but nothing ended up working out with our schedule. 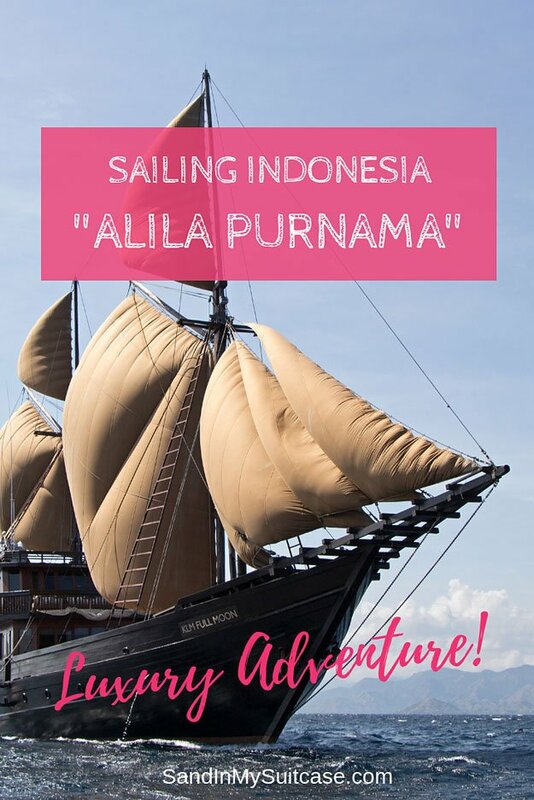 This post hast me looking for airfare deals as I’d love to do this trip aboard Alila Purnama. I think the dinner on your last night is such a special way to end the trip! We feel a little guilty sharing details about that last night’s dinner, as it’s really a bit of a secret. Staff don’t tell you about it as they want to keep it a surprise. Hopefully we haven’t ruined it for anyone by spilling the beans! Crossing fingers for you then. 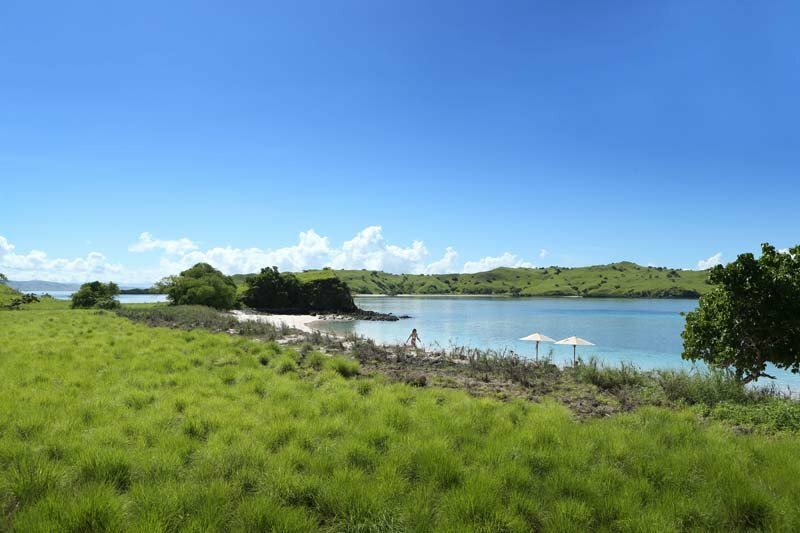 We just learned that the “Alila Purnama” has now introduced a couple of new itineraries (still all in the Komodo, Raja Ampat area of Indonesia), so they might be fun to look at too. Now this is a cruise I could drool over! Reminds me a lot of the Galapagos cruise I did last year. It’s probably a little similar to the Galapagos (a very small ship Galapagos cruise), though instead of the wide variety of animals topside, the emphasis is on the sealife underwater – except for the Komodo dragons, of course! Wow! What an amazing trip. The ship is beautiful and your adventures outstanding. Definitely going on my to-do list! It would make for a perfect anniversary trip! What a magical experience! I can’t believe this is real…lucky you! I so appreciate all of your lovely details. Absolutely breathtaking! Oh, I have to do this even though I am not a diver (but my husband is). I can snorkel though. What an amazing trip, I envy you. Such a great ship and service! That Komodo dragon looks pretty scary… I’m going to bookmark this post for future reference. Who knows, I may convince my husband to take me to Indonesia. 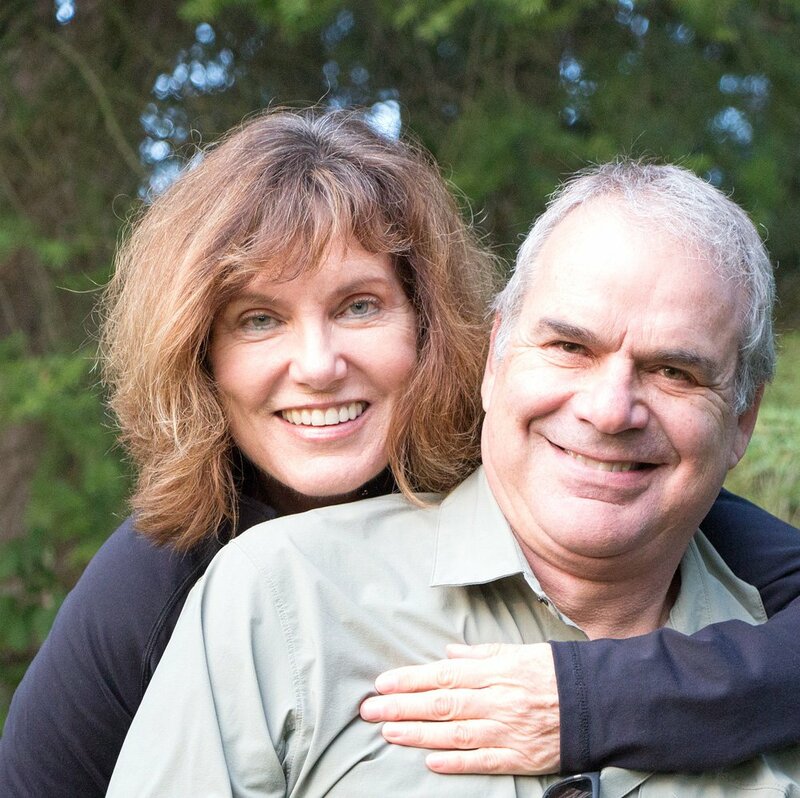 My sister and I MUST do this – I bookmarked your article! We have been in some of the beautiful waters off of Indonesia and wanted to return and, as avid snorkelers and besotted (but useless) sailors this is just the ticket! I don’t think I’d mess with one of the Komodo dragons but can’t figure out why a fisherman was up in a tree picking apples. Just goes to show that people should stick with what they know (well maybe it does)! I”m going to also share this on our FB fan page. Thanks so much! Sounds like you’d love to go snorkeling (and diving?) there. The good thing is you don’t have to know anything about sailing on this trip – you just get to watch and feel the swells under the hull. Thanks for sharing on your FB page! 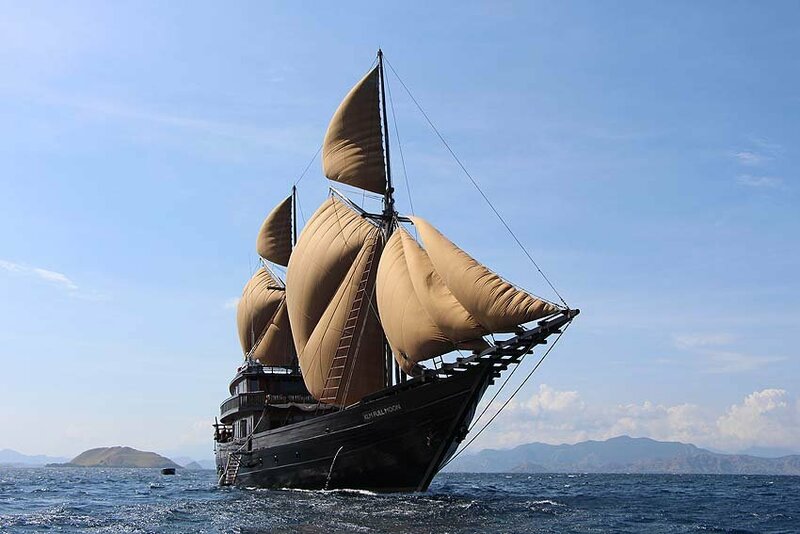 How spectacular is the Alila Purnama sailing ship! So beautiful and luxurious! Coincidentally, I just visited the Komodo dragons about a week ago but did the opposite trip. I spent the night in a barebones, but pleasant, backpackers hotel on Flores Island. The dragons weren’t breathing fire during my visit. In fact, they barely moved, all 5 of them. But what a thrill to be there and see them on their own turf. So you know what we mean when we say the dragons didn’t look too scary! And then you hear all these very nasty stories about the poor people who have been killed or injured by them. Ugh! Can’t wait to read about your Indonesia adventures now :-). Wow, what a stunning ship and service, I would love to do something like this. I have visited Komodo island and wondered what some of these ships look like and this one is spectacular and beautiful. Oh, so you’ve visited Komodo Island too! Then you likely saw the Komodo dragons as well. That was a big reason for us wanting to visit this part of the world – and, of course, the chance to sail on the Alila Purnama :-). Alila Purnama. Alila Purnama. Alila Purnama. Pardon me but I am trying to burn this place into my memory, it looks so amazing. Wonderful article. Burn away – you’re allowed :-). Glad you like the article :-). The Alila Purnama sounds like absolute heaven, with just the right combination of action (scuba!) and rest. Some day… some day . .. Even though I’m not a diver, I think I would have loved to be on this cruise. The juxtaposition of otherworldly reptiles and seaboard luxury is really intriguing. What a fabulous assignment. So nice you made the most of it! After seeing your photo of the komodo dragon, I feel like I can stop wondering what dinosaurs must have looked like. Your hike looking for the dragons reminds me of a nature hike in Costa Rica behind a very nervous seeming guide who warned us about venomous flying fer de lance snakes, but who didn’t have any suggestions about what to do to avoid them. Okay, flying venomous snakes sound a LOT more worrisome than sleepy Komodo dragons. We’ve heard there are all sorts of dangerous creatures you have to watch out for in Costa Rica. Wonder if that’s why we haven’t visited yet? No, just kidding – we’d love to visit there some day too. I didn’t realize that the Komodo Dragon was so deadly, or that Alila Hotels had a ship! Having visited the aquarium in Monaco today, I’d love to see more fish up close, what an amazing experience. It was interesting to see the Komodo dragons (even though they were sleepy most of the time) – probably just as well we didn’t have a more exciting encounter! 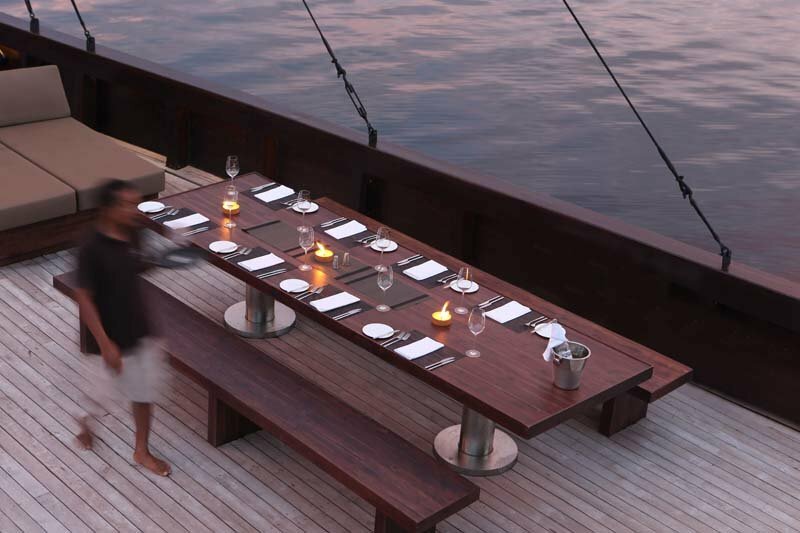 And could there be a more luxurious way to visit Komodo Island than with the “Alila Purnama”? 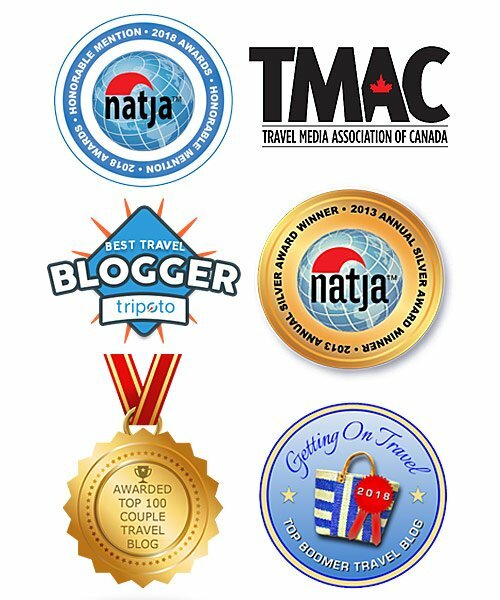 Just the way we love to travel: soft adventure combined with unapologetic luxury :-). What an amazing experience! I love the look of that boat. I went diving near Bali once and will always remember the beauty of the water and nearby islands. Great boat, looks like a pirate ship with the luxuries of a 5 star hotel. How the heck do you guys get these gigs? I recently saw a National Geographic show on Komodo dragons and those things are scary, they’ll run out of the forest and hunt you down. The place is a National Park and they’re the biggest predator and everything else is prey to them. Yes, we were pretty tickled when we got this assignment :-). We want to go to Raja Ampat too now. The scuba diving is supposed to be even more amazing there. Maybe we should charter the “Alila Purnama” for a cruise there! We could invite our friends and… Well, we can dream, right?